Recently, WKYC ran a special report by Senior Health Correspondent Monica Robins, on how 3D printing is changing the game for people who suffer from hair loss. Monica had the unique opportunity to meet Patty, who 12 years ago was injured in a farming accident causing her scalp to be ripped off from the back of her neck, all the way forward to her eyelids. The violent force of the accident took most of her ears as well. Welcome to our Best of 2017 series. We’re counting down your favorite posts from Jeffrey Paul Blog and looking forward to some of the surprises we’re planning for 2018! At Jeffrey Paul Salon, we have a team of experts to help you find the best hair solutions. We make sure that each hair transformation is customized to your unique needs. This process begins with a ScalpCheck to address any scalp issues you may have. Through our experienced staff, we can help you put your scalp issues behind you. We want to know: What is holding you back from getting help with your hair thinning and loss? If you suffer from dandruff, excessive scalp itch, hair loss or thinning and oily hair, you’re not alone. There are countless products on the market to help restore hair loss, but the root of the problem needs to be found. And this could involve the scalp. 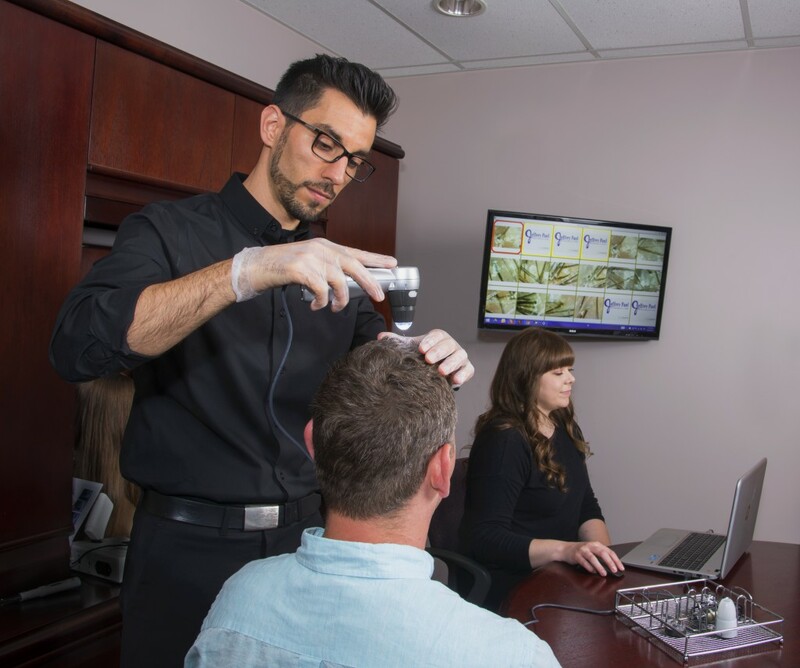 Emmanuel Paul, a licensed Trichology specialist at Jeffrey Paul’s Hair & Scalp Specialists who was interviewed by WKYC in Cleveland, Ohio, has helped with numerous scalp problems. One important element is to determine what is causing the hair loss problem to begin with. By performing a ScalpCheck®, experts can reveal the true reason and help you put those issues behind you. In the video above, Senior Health Correspondent Monica Robins from WKYC takes you through the ScalpCheck® experience. Your itchy, flakey head probably means you have dandruff, but do you really know how to eliminate it? Emmanuel Paul, of Jeffrey Paul Hair Restoration Center, has the answer. The image on the screen reminds Mimi Creative Director Lynn Margalit of plant life in the winter. In reality, however, Lynn is viewing a 200x magnification fo Alex Aella’s scalp — a field of snowy-looking dandruff infiltrating a forest of hair. Alex, a 35-year-old firefighter and father of two, is convinced that his severely itchy head is not caused by dreaded white flakes. His head, he believes, isn’t dry enough to produce dandruff. But Emmanuel Paul, a certified trichologist at the Jeffrey Paul Hair Restoring Center, in Fairview Park, has a feeling that he’s going to find the real answer as he begins a thorough examination of Alex’s hair and scalp. A series of tests using proprietary tools confirms his suspicion. Alex not only has dandruff, he has an extreme case of it. And, Emmanuel says, he has super oily scalp along with it. “People associate dandruff with dryness,” Emmanuel explains.”In reality there are two types of dandruff, which come from dry as well as oily scalps. Most people have dandruff to some degree. That’s why Head and Shoulders is the biggest selling shampoo in the country.” Unfortunately, Emmanuel reveals, that popular product may hide the problem but it doesn’t fix it. I am so very excited to show you how our work in digital media is being recognized as one of the top works in the industry. In the current issue of Heads Up by Aquage, they discuss how some salons are taking advantage of the digital age we live in. 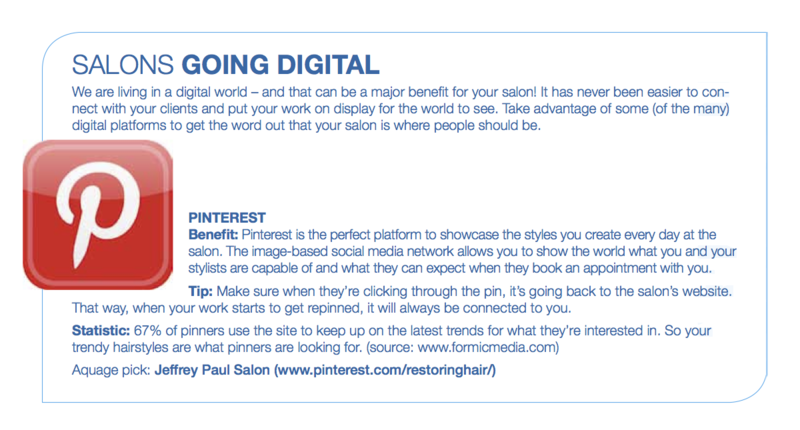 One salon, which they chose to feature, was my salon, the Jeffrey Paul Salon and the social platform Pinterest. I have a variety of boards from hair replacement success stories to tips on living healthy. I couldn’t be prouder to have my salon’s name be recognized by Aquage for being one of the leaders in the digital world. If you are on Pinterest, please check out what my Pinterest page has to offer here.